Natural history records of plant flowering and pollinator foraging, much of them collected by well informed amateurs, have huge scientific importance. One of the values of such records to ecology is that it allows us to document where these species occur in space and when they are active in time. This can be done at a range of spatial and temporal scales, but large-scale patterns (for example at a country level) are, I think, especially useful because they provide scientific evidence that can inform national conservation strategies. During 2017 I collaborated with a young early career researcher at the University of Sussex, Dr Nick Balfour, on an analysis of the phenologies of British pollinators and insect pollinated plants. That study was recently published (see citation below) and I think that the results are fascinating. Nick did most of the leg work on this, which involved assessing more than one million records that document the activity times of aculeate wasps, bees, butterflies and hoverflies held in the databases by three of the UK’s main insect recording organisations, the Bees, Wasps and Ants Recording Society (BWARS), the UK Butterfly Monitoring Scheme (UKBMS) and the Hoverfly Recording Scheme (HRS). Information on flowering times was taken from a standard British flora (Clapham et al. 1990 – Flora of the British Isles. Cambridge University Press). About two-thirds (62%) of pollinator species peak in their flight times in the late summer (July and August), though there was some variation between the different groups – see the figure from the paper above). Particularly noticeable was the double peak of the bees, with the first peak denoting the activity of many early-emerging solitary bees, such as species of the genus Andrena, whilst the second peak is other solitary bees plus of course the bumblebees which by that time have built up their colonies. A rather fixed phenological pattern with respect to different types of plants was also apparent, which I was not expecting at all: insect pollinated trees tend to flower first, followed by shrubs, then herbaceous species (again, refer to the figure above). This might be because larger plants such as trees and shrubs can store more resources from the previous year that will give them a head start in flowering the following year, but that idea needs testing. Putting those first two points together, what it means is that trees tend to be pollinated by those earlier emerging bees and hoverflies, whereas the herbs are mainly pollinated by species that are active later. When looking at the extinct and endangered pollinators, the large majority of them (83%) were species with a peak flight times in the late summer, a much larger proportion than would be expected given that 62% of all species are active at that time. However this was mainly influenced by extinct bee species and the same pattern was not observed in other groups. The obvious explanation for that last point is that historical changes in land use have led to a dramatic reduction in late summer flowering herbaceous species and the subsequent loss of floral resources has been highly detrimental to those bees. But intriguingly no such pattern was apparent for the endangered pollinators and clearly there are complex reasons why pollinators should become rare or extinct, a point that I have discussed previously on the blog. The lack of late summer flowering resources for pollinators is a contentious issue however as plant conservation groups have in the past recommend that meadows and road verges are cut in late summer to maximise plant species richness. Mowing road verges once or twice a year certainly benefits plant diversity, as this recent review by Jakobsson et al. (2018) demonstrates. But there’s very little data available that assesses how timing of cutting can affect pollinators. The only study that I know of (and if I’ve missed any, please let me know) that has considered this is the PhD work of one of my former students, Dr Sam Tarrant who looked at pollinators and plants on restored landfill sites compared to nearby nature reserves. In a paper that we published in the journal Restoration Ecology in 2012 we showed that on restored landfill sites the abundance of pollinators in autumn surveys (conducted September-October) was just as high as for summer surveys. On nature reserves, which are routinely cut from mid-July onward, this was not the case. (July and August). This was the case across three of the groups studied: aculeate wasps (71% of species), bees (60%), and butterflies (72%), the exception being hoverflies (49%). When species geographical range (a proxy for abundance) was accounted for, a clear late-summer peak was clear across all groups. By contrast, there is marked temporal partitioning in the flowering of the major plant groups: insect-pollinated tree species blossoming predominantly during May (74%), shrubs in June (69%), and herbs in July (83%). There was a positive correlation between the number of pollinator species on the wing and the richness of both flowering insect pollinated herbs and trees/shrubs species, per calendar month. In addition, significantly greater extinctions occurred in late-summer-flying pollinator species than expected (83% of extinct species vs. 62% of all species). This trend was driven primarily by bee extinctions (80% vs. 60%) and was not apparent in other groups. We contend that this is principally due to declines in late-summer resource supplies, which are almost entirely provisioned by herbs, a consequence of historical land-use change. We hypothesize that the seasonality of interspecific competition and the blooming of trees and mass-flowering crops may have partially buffered spring flying pollinators from the impacts of historical change. If any of you are near Wageningen University on 31st May I’m giving a talk about some of our recent research called “The macroecology and macroevolution of plant-pollinator interactions”. It’s preceded by a workshop on the whys and hows of science blogging. Details are in the poster. Plant-pollinator relationships are an ecologically critical form of interaction that ensures the long-term survival of the majority of the world’s plants species, and contribute to a large fraction of global agricultural output. In additiondiversity and abundance of biotically pollinated plant species can be an important determinant of the diversity of animals at higher trophic levels. Despite that global significance, most studies of plant-pollinator interactions are done at a local level, involving populations and communities of species, over modest time scales. The ways in which these local sets of interactions scale up to produce global macroecological and macroevolutionary patterns, and the processes underpinning them, will be explored using two case studies. The first is a data set of 67 plant communities, ranging from 70ºN to 34ºS, with which we investigated the roles of biotic and abiotic factors as determinants of the global variation in animal versus wind pollination. Factors such as habitat type, species richness, insularity, topographic heterogeneity, current climate and late-Quaternary climate change were investigated. The predictive effects of these factors on the proportion of wind- and animal-pollinated plants were examined (see: Rech et al. 2016 – Plant Ecology & Diversity 9: 253-262). Since these results were published we have increased the number of plant communities in our database to >90, and our findings seem to be robust to these additional data. The dominant influence of contemporary climate on the relative importance of wind-pollinated species suggests that communities may be sensitive to future climate change. Communities in areas that are predicted to become drier may in time contain more wind-pollinated plants which may in turn reduce the diversity of pollinator species that are present. There may also be implications for the prevalence of human pollen allergies. Future work will focus on these two areas. The second case study uses a newly assembled database of pollinators of the family Apocynaceae (one of the ten largest families of flowering plants), supported by a molecular phylogeny of the major clades. This database has been used to explore phylogenetic and biogeographic patterns of pollinator exploitation (Ollerton et al. in review). The findings from this study challenge some long-held assumptions about convergent evolution, the role of rewards such as nectar, and the notion that some specialised pollination systems are evolutionary “dead ends”. It also highlights the function of novel floral features in determining pollinator type and behaviour, such as the fused gynostegium and pollinia found in the subfamily Asclepiadoideae. In summary, Apocynaceae is emerging as an important model family for understanding the ecology and evolution of plant-pollinator interactions. Blogging for EEB: why bother? Plant-pollinator networks in the tropics: a new review just published. As an ecologist who has carried out field work in the temperate zone (UK), the subtropics (Tenerife and South Africa) and the tropics (parts of South America, Africa and Australia) I’ve always found the idea that the study of ecology can be divided into “tropical” and “non-tropical” a bit odd. It’s as if the way that the natural world works somehow changes at about 23 degrees north or south of the equator, making things “different” around the equator. The tropics are a very special, diverse place, it’s true, but so are many places outside the tropics. Most tropical plants rely on animals for pollination, thus engaging in complex interaction networks. Here, we present a global overview of pollination networks and point out research gaps and emerging differences between tropical and non-tropical areas. Our review highlights an uneven global distribution of studies biased towards non-tropical areas. Moreover, within the tropics, there is a bias towards the Neotropical region where partial networks represent 70.1% of the published studies. Additionally, most networks sampled so far (95.6%) were assembled by inferring interactions by surveying plants (a phytocentric approach). These biases may limit accurate global comparisons of the structure and dynamics of tropical and non-tropical pollination networks. Noteworthy differences of tropical networks (in comparison to the non-tropical ones) include higher species richness which, in turn, promotes lower connectance but higher modularity due to both the higher diversity as well as the integration of more vertebrate pollinators. These interaction patterns are influenced by several ecological, evolutionary, and historical processes, and also sampling artifacts. We propose a neutral–niche continuum model for interactions in pollination systems. This is, arguably, supported by evidence that a high diversity of functional traits promotes greater importance of niche-based processes (i.e., forbidden links caused by morphological mismatching and phenological non-overlap) in determining which interactions occur, rather than random chance of encounter based on abundances (neutrality). We conclude by discussing the possible existence and direction of a latitudinal gradient of specialization in pollination networks. A fundamental feature of the natural world is that no species exists in isolation: all organisms interact with other organisms during their lives. These interactions take many forms and the outcome varies with the type of interactions. For example predator-prey interactions are clearly negative for the prey species, but positive for the predator. Other interactions result in positive outcomes for both species, including relationships between pollinators such as bees, birds and flies, and the flowers that they pollinate. An important feature of such interactions is how specialized or generalized it is; that is, how many different pollinators are actually involved in pollinating a particular type of flower, or how many types of flower does a specific pollinator visits. In a newly published study, I have collaborated with colleagues from Denmark and Brazil to assess how local specialization (within a community) relates to regional specialization (across communities) using two separate data sets from the Brazilian rupestrian grasslands and Canary Island/North African succulent scrub vegetation. If you would like more information on plant-pollinator networks, including details of an edible game for Christmas (! ), follow this link to the standingoutinmyfield blog. In a new review paper that’s just been published in the Annual Review of Ecology, Evolution and Systematics I have looked at the question of just how diverse the pollinators are, and why pollinator biodiversity is ecologically important and therefore worthy of conservation. I’ve taken a deep time and wide space approach to this, starting with what the fossil record tells us about when animal pollination evolved and the types of organisms that acted as pollinators in the past (the answer may surprise you if you’re unfamiliar with the recent paleontological literature on this topic). Some of the most prominent biogeographical patterns have been highlighted, and I have tried to estimate the global diversity of currently known pollinators. A conclusion is that as many as 1 in 10 described animal species may act as pollen vectors. As well as this descriptive part of the review I’ve summarised some recent literature on why pollinator diversity matters, and how losing that diversity can affect fruit and seed set in natural and agricultural contexts. Extinction of pollinator species locally, regionally, and globally should concern us all. Although I was initially a little worried that the review was too broad and unfocused, having re-read it I’m pleased that I decided to approach the topic in this way. The research literature, public policy, and conservation efforts are currently moving at such a fast pace that I think it’s a good time to pause and look at the bigger picture of what “Saving the Pollinators” actually means and why it’s so important. I hope you agree and I’d be happy to receive feedback. You can download a PDF of the review entitled Pollinator Diversity: Distribution, Ecological Function, and Conservation by following that link. Pollination ecologists should also note that in this same volume of Annual Review of Ecology, Evolution and Systematics there’s a review by Spencer Barrett and Lawrence Harder called The Ecology of Mating and Its Evolutionary Consequences in Seed Plants. If you contact those authors I’m sure they’d let you have a copy. The blog has been a bit quiet of late, due to a lot of traveling on my part, starting with field work in Tenerife, then a weekend away with friends on the Isle of Wight, followed by the topic of this post: PopBio2017 – the 30th Conference of the Plant Population Biology Section of the Ecological Society of Germany, Austria and Switzerland in Halle, Germany. And I’d like to begin with a story…. The organisers of PopBio2017 had invited me to be one of five keynote speakers at the conference and I was due to deliver a talk on “The macroecology of wind and animal pollination” first thing (09:00) on Thursday morning. So the night before I duly set my phone’s alarm for 07:00, thinking I’d have enough time to get ready, have breakfast, then take the tram to the venue (a 15 minute ride/walk). It was a very hot night and I left the windows open, but my mind was restless with thoughts of how to deliver the talk most effectively. So I kept waking up during the night, and actually slept through the alarm. The next thing I know it is 07:45 and I am being woken up by an urgent buzzing noise….from a bee! I swear this is true: a bee had flown in through the window, buzzed for a few seconds right in front of my face, and woke me up in time to deliver my talk on pollinators! It then turned around and flew straight back out of the window. It actually wasn’t until I’d jumped out of bed and into the shower that I’d woken up sufficiently to appreciate what had happened…and wondered if anyone would actually believe me! Anyway, I got to the venue with 15 minutes to spare, the talk seemed to go well, and it’s a story I think I’ll enjoy telling for some time to come. The conference was really fabulous, with some very impressive science on show. It was a good mix of postdocs, PhD students, and established researchers talking on a diverse range of plant ecology topics, not just “plant population biology” (whatever that really is – there was some discussion on that score). The organisers had arranged the programme so that the keynotes in each session were followed by shorter talks broadly related to that topic, so I was followed by a series of presentations on pollination biology. And very good they were too. It was a thirsty conference – “To beer or not to beer….”? Finally thanks to the organisers of PopBio2017 for the invitation to speak, and to all of the conference attendees who made it such a special meeting. In collaboration with colleagues in Brazil, Denmark, and elsewhere in the UK, we’ve just published a new research paper which looks at the global spatial distribution of wind and animal pollinated plant species, and the underlying historical and contemporary ecological causes of that distribution. It’s a study that builds on my “How many flowering plants are animal pollinated?” paper in Oikos, and has been a long time in its gestation. We’re very excited by its findings and plan to develop this project in the future. As a bonus we made the cover of the journal with the amazing image below! Big thanks to Pedro Viana and Jesper Sonne for the photos. Here’s the citation with a link to the publisher’s website; the abstract is below. If anyone wants a PDF copy, please ask. Background: The relative frequency of wind- and animal-pollinated plants are non-randomly distributed across the globe and numerous hypotheses have been raised for the greater occurrence of wind pollination in some habitats and towards higher latitudes. To date, however, there has been no comprehensive global investigation of these hypotheses. Aims: Investigating a range of hypotheses for the role of biotic and abiotic factors as determinants of the global variation in animal vs. wind pollination. Methods: We analysed 67 plant communities ranging from 70º north to 34º south. For these we determined habitat type, species richness, insularity, topographic heterogeneity, current climate and late-Quaternary climate change. The predictive effects of these factors on the proportion of wind- and animal-pollinated plants were tested using correlations, ordinary least squares (OLS) and logistic regression analyses with information-theoretic model selection. Results: The proportion of animal-pollinated plant species was positively associated with plant species richness and current temperature. Furthermore, in forest, animal pollination was positively related to precipitation. Historical climate was only weakly and idiosyncratically correlated with animal pollination. Conclusion: Results were consistent with the hypothesised reduced chance for wind-transported pollen reaching conspecific flowers in species-rich communities, fewer constraints on nectar production in warm and wet habitats, and reduced relative effectiveness of wind dispersal in humid areas. There was little evidence of a legacy of historical climate change affecting these patterns. The latest in an (ir)regular series of posts to biodiversity-related* items that have caught my attention during the past few weeks; this one’s focused on pollinators and pollination because there’s been so much emerging on this recently it’s been impossible to decide what to write more fully about! In “Disentangling visual and olfactory signals in mushroom-mimicking Dracula orchids using realistic three-dimensional printed flowers” in the journal New Phytologist, Tobias Policha and colleagues have used artificial, 3D printed flowers to assess the relative importance of scent versus colour/shape in some fly pollinated orchid species. Yes, Dracula is a real genus! In the journal Nature, Mathilde Baude and colleagues have looked at how nectar resources have changed in extent and composition over the 20th Century in a paper entitled “Historical nectar assessment reveals the fall and rise of floral resources in Britain“. An important disease of honeybees, Deformed Wing Virus (DWV) is “driven by trade and movement of honeybee colonies” according to a new study in Science by Lena Wilfert and colleagues, “Deformed wing virus is a recent global epidemic in honeybees driven by Varroa mites“, further emphasising what many of us have been saying, that reduction in honeybee numbers is largely a veterinary/husbandry problem, rather than a conservation issue. Some of my colleagues in Denmark and Brazil (amongst other countries) continue their exploration of the ecology and evolution of hummingbird-plant interaction networks with a new paper in Proceedings of the Royal Society B entitled “High proportion of smaller ranged hummingbird species coincides with ecological specialization across the Americas“. Also in Proceedings of the Royal Society B, Conrad Labandeira and (particularly Chinese) colleagues have documented some amazing similarities between extinct fossil lacewings and butterflies, in “The evolutionary convergence of mid-Mesozoic lacewings and Cenozoic butterflies“. On the 20th May there’s going to be an exciting one-day symposium entitled “Bats, Bees, Birds, Butterflies and Bouquets: New Research in Pollination Biology” at the Smithsonian’s National Museum of Natural History in Washington D.C. Wish I could go! Finally, the United Nations Food and Agriculture Organization (FAO) has a whole set of resources related to its Global Action on Pollination Services for Sustainable Agriculture programme, including a newly released “Protocol to detect and monitor pollinator communities: Guidance for practitioners” by Gretchen LeBuhn and colleagues. Worth exploring in detail. Something that’s unclear to me is the extent to which this aspect of the FAO’s work is going to be replaced or duplicated by the report (and presumably subsequent, follow-up work?) on pollinators and pollination that’s due this year from the Intergovernmental Platform on Biodiversity and Ecosystem Services (IPBES), about which I hope to report in the near future. Feel free to recommend links that have caught your eye. *Disclaimer: may sometimes contain non-biodiversity-related items. Back in March 2014 I reported about a guest blog that Angela Moles (University of New South Wales) and I had written for the Dynamic Ecology blog entitled “Are species interactions stronger and more specialized in the tropics?” The post generated a lot of comments, not all of them supportive of what we were saying. It also resulted in an invitation from the editor of the journal Biotropica to write up the post as a commentary. This we did and duly submitted, it went through a couple of rounds of peer review, and has now finally been published. Extinction of species is perhaps the most fundamental assault that we as humans can inflict on the rest of the natural world. Extinctions take a range of forms, from the loss of a whole species (such as the sad case of the St Helena Giant Earwig, recently declared extinct by the IUCN), down to extirpation of local populations. 1. How many bee and flower-visiting wasp species have gone extinct in the UK? 2. Is the rate of extinction (e.g. 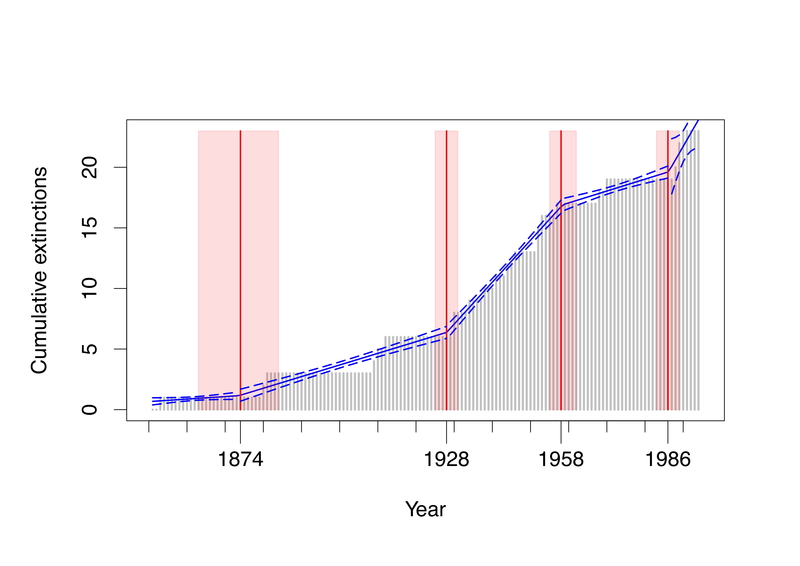 number of species per decade) constant or variable over time? 3. Can we interpret any patterns in relation to broader societal changes, for example in agricultural policy, conservation strategies, etc? The research is a collaboration between myself and University of Northampton colleagues Dr Robin Crockett and Dr Hilary Erenler, together with Mike Edwards from the Bees, Wasps & Ants Recording Society (BWARS), the c. 500,000 records of which were used in these analyses. This is probably the most extensive data set on these insects available for any country and an important resource. The answer to the first question is that 23 species of bees and flower-visiting wasps have gone extinct, ranging in time from the crabronid wasp Lestica clypeata (last observed in 1853) to the solitary bee Andrena lathyri (not seen since 1990). All of these species still occur on mainland Europe, so these were country-level extinctions, not species extinctions. The four periods marked in red are the points where we estimate the rate of extinction changed (with 99% confidence intervals shown in pink). The most rapid rate of extinction (shown by the solid blue piecewise regression lines and dashed 99% confidence intervals) is from the late 1920s to the late 1950s. This, we believe, is the cumulative effect of agricultural changes precipitated and then augmented by the First and the Second World Wars, respectively. The period of extinction from the late 19th into the early 20th centuries was probably caused by increased import of South American guano as soil fertilizer which increased grass productivity at the expense of wild flower diversity. This reduced reliance on strict rotational cropping, including fallow periods with nectar- and pollen-rich weeds, and N-fixing legume years. However it was the invention of the Haber Process in 1909, allowing industrial manufacture of inorganic nitrogen fertilizers for the first time, that fundamentally affected British agriculture. The slow down of the rate of extinction from the early 1960s to the mid 1980s is not easily explained given the continued intensification of farming, encouraged by Common Agricultural Policy subsidies. It could be due to the most sensitive species having been already lost, or because of conservation initiatives including the establishment of more nature reserves by organisations such as the Wildlife Trusts and the RSPB, habitat restoration and management by groups such as the British Trust for Conservation Volunteers, more farmers going organic, etc. Or it could be a combination of both, and/or factors we’ve not yet thought of. The final period of extinctions from 1986 to 1994, where the rate seems to increase, could be seen as evidence against the slowing in the rate of decline of pollinators in north west Europe found by Carvalheiro et al. (2013). However we need to be cautious here as there’s a large confidence interval around the calculated extinction rate. The four extinctions between 1988-1990 could be an isolated cluster, or the start of a further period of relatively high extinction rate. Only time will tell! Bees, wasps and other pollinating insects are absolutely vital to the functioning of our natural ecosystems and for a great many agricultural crops. We’ve known for some time that these insects are declining in Britain but now we can see how historical agricultural changes have caused species to become extinct. The big question is whether these extinctions have stopped or whether they will continue in the future. The species that have been lost to Britain still survive on the Continent and there is the possibility of natural re-colonisation or artificial reintroduction, both of which have occurred in recent years. However in order for this to be successful we must restore as much natural habitat as possible within our farmland, which after all covers some 70% of the British land surface. The irony of our findings, of course, is that pollinators are vital for agriculture, as the UK Government’s National Pollinator Strategy recognises. Studies such as this illustrates the importance of maintaining the year-on-year effort of recording natural history data – the research simply wouldn’t have been possible without the BWARS records, which are mainly collected by amateur naturalists. The full citation for the paper is: Ollerton, J., Erenler, H., Edwards, M. & Crockett, R. (2014) Extinctions of aculeate pollinators in Britain and the role of large-scale agricultural changes. Science 346:1360-1362. I’m happy to send a PDF to anyone who requests a copy for personal use. 1. We define “extinction” as ≥ 20 years since the last recorded occurrence of the species in Britain, which is why the data stop at 1994. 2. We have excluded single early records of species that cannot be verified as representing stable breeding populations. 4. Thanks to Robin Crockett for the figure and the analyses, and Hilary Erenler and Mike Edwards for their input into the study.